Since 2006 Iâ€™ve made a living creating world-class digital experiences for humans as a Designer and Software Engineer. In that time, Iâ€™ve been fortunate to work with excellent people at three small companies, as a freelancer, and as a business owner. This site is a work-in-progress effort to document my work and myself. 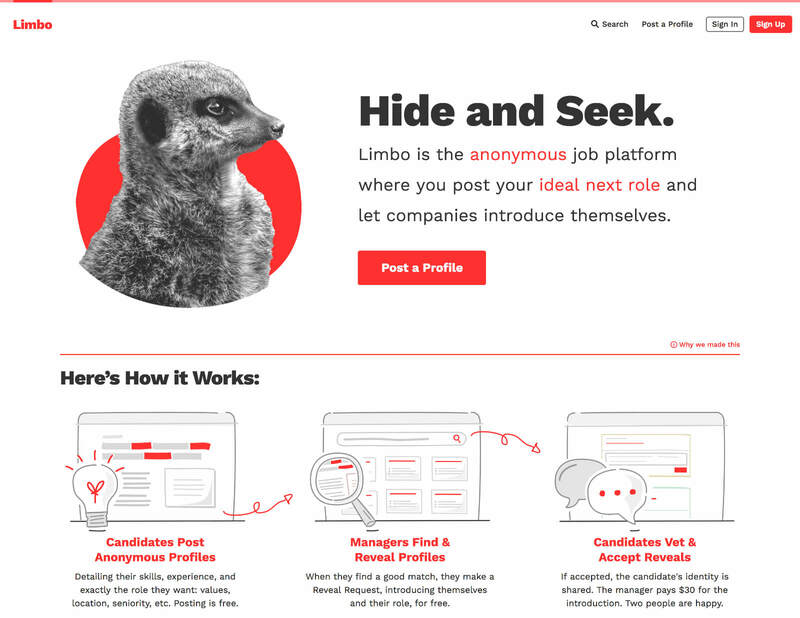 Limbo is an anonymous job platform. We made it to make tech recruiting more humane. Chris came to me with the idea and an early prototype and invited me to join him as a partner. I wrote more about our origin story in Starting Something New. We were trying something different with Limbo. Chris and I were eager to see something in tech recruiting that we hadnâ€™t seen before so we set out to create it. We also wanted to start a business on our terms. A business where growth for the sake of growth wasnâ€™t the goal. We donâ€™t have an exact count, but we know we helped many companies find quality candidates that made it to interview processes and a number of hires from those. At the beginning I said Iâ€™d be happy if we could help make one hire. We did that and then some. In March 2018 we moved Limbo to side project status to allow us to move on to other opportunities. Chris wrote his thoughts about it. Our approach to business allowed us to focus on designing a slow product. Not slow in terms of our speed of production. Slow meaning the product doesnâ€™t beg for customersâ€™ attention every minute. We designed Limbo to encourage candidates to take their time and think about what type of work would make them happy. We designed Limbo to slow hiring managers down to really think what qualities they need to see in a potential team member. Limbo is a tool for accomplishing tasks, not a thing to engage. From early on, we iterated on the design in browsers. To help that process I built and maintained a Pattern Library. Our pattern library helped us keep consistent design while collaborating and moving fast. We didnâ€™t use any fancy tech for it. The first iteration of the library was a single html file with no styles. I built it up from there as we moved along and learned more about our needs. Chris handled the infrastructure and server-side work. Limbo is built with Python/Django and runs on AWS by way of Elasticbeanstalk. We made use of Elasticsearch for our Profile search capabilities. Our team was instrumental in the initial Hillary for America website launch. In the days leading up to the April 12, 2015 launch we helped the HFA tech team and another web development vendor implement a Wagtail CMS, implement designs, squash bugs, and make sure the the site could handle the massive traffic it was about to receive. In the months after launch we continued our work with the growing HFA tech team. We played an instrumental role in interviewing candidates and making recommendations for designer and engineer hires for HFA. We also continued daily work on hillaryclinton.com. Myself along with other members of the Groundwork helped complete the frontend engineering necessary for the HFA launch rally in New York City. Our team also built the events microservice and API that powered the events section of the HFA website. Over 14,000 people RSVPâ€™d for the launch rally using backend and frontend systems built by our team. This was only the beginning. Mattâ€™s Storify is an excellent overview of what we accomplished. While I never held the official title, I got to act as a de facto Lead of the Frontend Team at The Groundwork. For a time it was the largest team at seven excellent humans. I see leadership roles as a service position. My primary role during that time was to help make sure each member of the team had everything they needed to do great work. I didnâ€™t always succeed. In fact, I made mistakes daily. But I got the opportunity to try, so I did every day. Did a bunch of this. Write up a bit on Dev Center process and iteration. Nikki and Ivan and Jim have great write-ups about work they did. React, Redux, Immutable.js, CSS modules, Travis, Immutable infrastructure with AWS, next-level custom tooling for cloud infra management. Darren wrote about interesting work we did on the frontend. ColorMe is a tool to visualize future CSS color manipulation functions. Itâ€™s also just a fun lilâ€™ color picker. Iâ€™d read about the potential of Sass-like color manipulation coming to CSS. I was also familiar with SassMeâ€“built by a friend and former Co-workerâ€“that made working with color manipulation functions easier. I had a bit of time off from work and wanted a project to tinker with, so I set to build a tool for working with the possible future CSS color functions. In the weeks following the release I added a number features like; rrggbbaa support, a color picker, and a few other things I forgot. For me, the color function aspect has become secondary. ColorMe has turned into my go-to color picker. That wasnâ€™t intended, but is a fun side-effect. In January 2017, color() was part of an editorâ€™s draft CSS spec (link). Since then, that has changed. Itâ€™s unclear what the fate of color modification in CSS is, but the syntax will not be color(). Thatâ€™s being developed in a different specification. I made use of Ian Stormâ€™s css-color-function package for ColorMe. I discovered a couple bugs and needed tweaks to it during development and contributed back to the library. Ian made me a contributor in late 2017 to help shephard the project along. After a few lengthy discussions about the libraryâ€™s future, work as paused for while. Itâ€™s not dead, weâ€™re just holding off for a while since the CSS spec is in flux. Create React App, Travis, AWS S3, ACM, ServiceWorker, Web manifest, bad bash scripting. I didnâ€™t do much with it for while. Then, I got word that my talk proposal on the topic was accepted by MidwestJS 2015. In the months leading up to the conference I dove back and learned how all the pieces worked together again to put together a talk. During that time I also experiemented with a build process for it using webpack and started a jQuery-esque UI library for JXA called Starstuff. This was my first conference talk. Iâ€™ve had plenty of proposals rejected over the years, but this one made it in. In the early days of Jennâ€™s EXTREMELY CHILL social gathering, she invited folks to give short talks. I used that as an excuse to make Springsteen-themed slides. An email from former Apple automation product manager, Sal. He sent me a short note to say he saw the post and thought it was cool and thanks for working with the technology. Of all the recognition I got for this project, this felt the best. If you ever need someone to design a red and white reading website or application, Iâ€™m your guy. Iâ€™ve had the good fortune to work on three innovative reader-focused products in my career. Readability was an advocate for readers. From the day Readability launched, I wanted to work on it. The original design by Darren blew me away. In those early days it seemed like every person I looked up to in design was involved in some way. Zeldman, Mandy, Chris Dary, Teehan+Lax, and so on. The excitement and momentum around it at that time was palpable in the Arc90 office and I wanted so bad to be a part of it. In November 2011 I got the chance. I switched from client work at Arc90 to a Designer and Frontend Engineer on the Readability team. I was so excited! For about a year I helped continue the high standard of design and build iterative improvements to the Readability website. In early 2013 we had a gap in the team. This a product that I loved and used daily so I asked Rich(link) for a quick chat where I asked him if heâ€™d consider me for the vacant role of Product Lead of Readability. I was thrilled that Rich and the Readability team gave me the thumbs up and trusted me to take on the role. Over the next year I helped lead the team on successful efforts to rebuild the Chrome extension, modernize the Reading view, and relaunch Top Reads. The biggestâ€“and my lastâ€“effort I helped lead was a complete redesign and rebuild of the iOS app and in tandem a redesign of the website. Both included the biggest addition to Readability since its launch; Recommendations. I left Arc90 on Feb. 14, 2014. The work I got to do and the team I got to do it with during that time will always be on a pedestal for me.